Today, while randomly exploring Kansas City, I walked into Union Station during a Open House event featuring a modern trolley that KC leaders would like to see downtown by 2015. 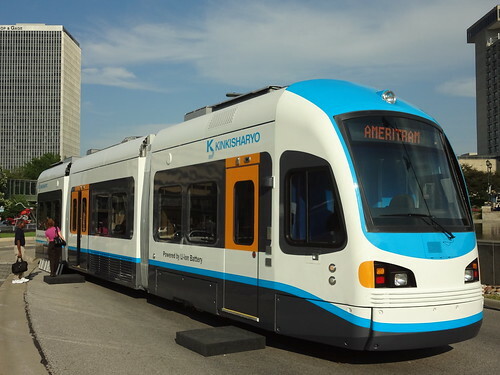 The model on display, courtesy of Kinkisharyo, was a new ameriTRAM designed specifically for American cities wishing to bring back streetcars. Its bragging points include a 100 percent low floor and an “e-hybrid” system designed to run on overhead power or lithium-ion batteries for up to five miles. Even while operating on batteries it has several security cameras, wireless internet, and lcd information screens. The light weight cars will not necessitate bridge replacement on the proposed routes through downtown Kansas City, and will help to lower the cost of laying track. 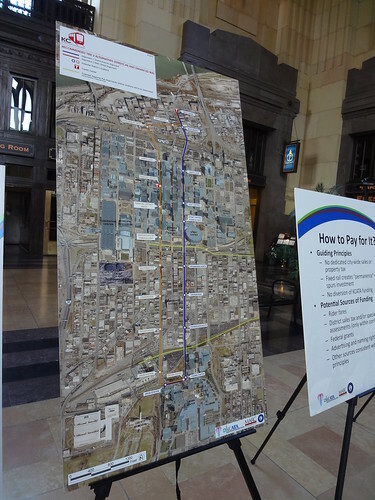 Because the plans include only routes that are around two miles long, overhead wires are unnecessary, eliminating not only a possible eyesore but also the associated expenses. Coincidentally, the length of the Loop Trolley in St. Louis is approximately two miles long as well. Could our local streetcar project use the ameriTRAM? Could completely eliminating overhead power help lower the price tag? One of the first things that this blog did was come out against the Loop Trolley project. I still don’t think that this particular implementation is a great addition to our transit system because it does little more than duplicate the coverage of the Metrolink and the 97 Delmar Bus. Other critics have argued that it just connects Blueberry Hill to the Pagent. If the project is perceived as a failure, it could help prevent new investment in more substantial public transit infrastructure in the future. On the other hand, streetcars are awesome, and the potential for this project to spur expansions is too exciting to ignore. To best take advantage of this opportunity, we must make sure that the Loop Streetcar is effective and well received. One easy and substantive way to make this project more legitimate is to use cutting edge technology – the latest modern streetcars. In my opinion, a sleek, modern and attractive streetcar will be even more enticing to the curious pedestrian or motorist than a replica of a historic trolley. I think it’s an option worth considering. The advantages are considerable. The Intersection of Art and Life has been off to a great start this year. Kota Fire Grill is open and with the same ownership as Triumph Grill I have faith that it will outlast its location’s recently previous tenants. Around the corner at 3526 Washington, a new hair salon, Salon Edge Hair and Tanning is open, with a Jewelry Store, Grand Center Jewelers, and a Computer Repair shop, Virtual Technologies. This retail space is a great addition to Grand Center and I wish these businesses success. Luckily they will be able to take advantage of added traffic from the City Diner @ The Fox which although behind schedule (what isn’t) appears to be well on it’s way to opening. Today I saw this public announcement about a neon sign for the new diner. Extremely exciting. Another recent move to Grand Center was made by the Veterans Affiars Dermitology Clinic to the retail space in the Continental Life Building on Olive. Today when I went to take a picture of this new office I found an even better picture @ Grand and Olive. The history of Grand Center is its greatest asset in my opinion and I think this is one pothole the city should not repair. Also underway is work on the new location of Sweetie Pie’s on Delmar. I’m very glad to see that the ugly facade is being removed to expose the brick building. I am very happy to hear about this new Grand Center Development and think that another school in the area (there are already at least 2 in Grand Center) will be great. 2010 is looking pretty nice for Grand Center and I can’t wait to see these latest projects reach completion. Streetcars always been something that interested me ever since I was a young boy listening to my Grandfather’s stories about growing up in St. Louis. So many stories involved streetcars, because they were such an integral part of life. My Grandfather was born in 1905 and I can’t even imagine what it was like to live in St. Louis then. It’s a little hard to tell from the small picture below (click on the photo for the full size version), but the red lines represent streetcar lines and show how accessible this city once was to pedestrians. Seeing so much [private] public transportation available is basically unfathomable from my perspective as a St. Louisian in the 21st century. Today we are really lucky to have MetroLink (the Wikipedia’s List of Light Rail Systems in the United States by Ridership shows us as number 10; sad for many reasons but worth bragging about! ), and must hope that its existance and future expansion will help us rebuild (restore) our dense urban core. I would like to personally thank those people who paved the way for MetroLink by building the most expensive infrastructure over 100 years ago. James Eads’ beautiful bridge is a vital part of the system and even more so is the downtown train tunnel running up Washington from the bridge to Eighth street, and then south out of the Central Business District. Thanks to the wonderful archives of the New York Times we can get a glimpse of our city in 1873 when this article was written about the construction of the tunnel. We do have a lot to be thankful for living in St. Louis and this, in addition to my ignorance about the true nature of the circumstances of the demise of the streetcar, prevent me from succumbing to bitterness about the current state of transportation here. More about St. Louis Transportation’s Past and Present to come.